Boris Johnson has entered the race to be the Conservative candidate for London mayor in next year's election. Mr Johnson, one of the best-known MPs, has confirmed that he wants to take on Labour's Ken Livingstone. Surrounded by a media scrum as he pushed his bike outside City Hall, he said he was "thrilled and excited". About 50 people have applied to be Tory candidate. The party will now draw up a shortlist, with Londoners then able to vote to select who is Tory candidate. 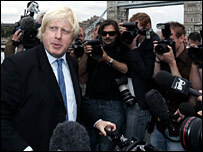 Mr Johnson, speaking among a throng of photographers and reporters in chaotic scenes, praised London as a "fantastic city" and said being mayor would be a "wonderful chance to serve London". He has resigned as shadow minister for higher education, but he is to remain MP for Henley. He added: "I have been overwhelmed by the support I have received from so many people across London." "London is an outstandingly varied and beautiful place and it deserves a proper debate. I want to bring fresh ideas to the capital and offer a new direction for Londoners. "I believe that the Mayor of London should keep things simple and direct his or her intellectual energy at the core problems that affect people's everyday lives." "Even the greatest cities have further greatness in them. I will stand for a greater London and for putting the smile back on London's face," said Mr Johnson. Private Eye editor Ian Hislop, with whom the MP has appeared on the BBC satirical show Have I Got News For You, said: "It's good news for comedy, if not for London. "I just think it'll make life much more interesting." The confirmation of Mr Johnson's candidacy brings to an end a long search by the Conservatives for a big name candidate with a realistic chance of beating Ken Livingstone. Previous possible runners have included Greg Dyke, Digby Jones, Nick Ferrari, Lord Stevens and Sir John Major. Mr Livingstone - who was elected London's first mayor as an independent and then won a second term after being allowed back into the Labour Party - has said he wants a third term. Like Mr Johnson the current mayor is a politician with a high media and public profile. A Conservative Party spokeswoman said the party would not comment on Mr Johnson's application - or the other contenders who have applied to be the party's candidate. But Tory MP Ed Vaizey, who is close to Mr Johnson and Mr Cameron, said a contest between Mr Johnson and Mr Livingstone would be "electric" and would boost voter turnout. "Boris finds it quite hard to resist a challenge and I think taking on Ken would be the kind of 'big beast' challenge that would be very attractive to Boris," he told the BBC. The party says it will not name candidates yet - it will be up to them to promote themselves. They will be considered by a committee who will put forward about ten candidates for interview by an electoral college of London Conservatives this weekend. The Conservatives will now draw up a shortlist of between two and five candidates to go forward to an "open primary" of all London voters, closing on 26 September. The winner is likely to be announced at the end of September. Mr Johnson had been shadow higher education minister before launching his mayoral bid, and was previously editor of the Spectator magazine. He has been a frequent guest on television shows such as Have I Got News for You, and has come under fire in Liverpool and Portsmouth for critical comments he made about the cities. Responding to the news, Mr Livingstone attacked Mr Johnson's record on voting in the House of Commons, and said he would be "seriously damaging for London". "He did not bother to vote in the House of Commons to defend the Freedom Pass for free travel for older people," he said. "He did not even bother to vote on the Parliamentary Bill in favour of Crossrail - the most important transport project for London." The Liberal Democrat candidate last time round, Simon Hughes, welcomed Mr Johnson's decision to stand. He told BBC Radio 5 Live: "The reality is that the capital city is the most liberated and free-speaking place in the country and it's almost certainly the most invigorating and liberated city in western Europe if not in the world. "Therefore if you can't have characters standing who are willing to speak their mind, then it would be a sadder place." Can Boris take on Ken?